Though 3D printing technology is still relatively new, it may become an important tool for architects and the construction industry, as highlighted by projects like the recent 3D-printing of 10 homes in a day. 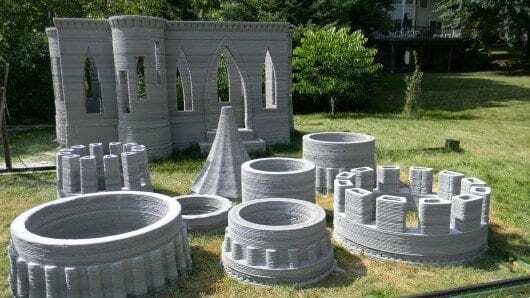 The latest example of this progress comes via US-based Andrey Rudenko, who has created a small concrete “castle” structure in his backyard using a large 3D printer he built himself. Next up, he’s making a house. The 3D-printed castle is 2 years in the making, and began with Rudenko first fabricating a small 3D printer which printed using plastic. It took some time before he scaled-up to a much larger unit that could print in concrete reliably, but once Rudenko had solved issues like clogging, he was good to go. The castle took a total of 2 months to print from start to finish. The 3D printer pushed out strips of 10 x 30 mm (0.4 x 1.1 in) concrete, which were then layered atop each other. However, with a printing rate of 50 cm (19.6 in) per 8 hours, it could have been built much quicker had Rudenko not taken his time tweaking the printer’s settings, testing its abilities, and ensuring that the quality was good.